Bean podborer (Maruca vitrata) have been observed in large numbers (>20/m2) in flowering/podding mungbeans planted from January onwards in the Burnett region. They are likely to be present in other coastal/subcoastal regions such as the Burdekin, Callide Valley and the Wide Bay/Burnett (particularly in late-planted crops), and to a lesser extent in the eastern Darling Downs, and Emerald in Central Queensland. Successful podborer management requires larvae to be controlled BEFORE they move from the flowers to the pods. Podborers can move into a crop at early budding, and the first sign of major outbreaks are flights of the distinctive moths (25 mm wingspan), which rest with outstretched wings (see photo above). 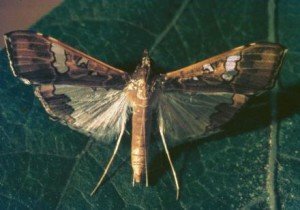 To flush moths out, walk through the crop and tap the plants with a beat stick. 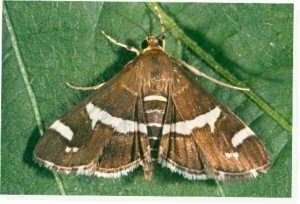 Don’t confuse the moths with the similarly sized beet webworm moth (photo right). Beet webworm wings fold back at rest and the hindwing is mostly brown. 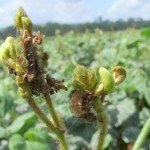 The first signs of visible damage are the webbing of budding/flowering racemes by larger larvae. Eggs are laid on or between the petals and are difficult to detect. Hatching larvae feed inside the flowers, and their presence is not externally obvious until they become larger and web the racemes, and/or move to pods touching the flowers (in more advanced crops). Once larvae bore into to the pods, they are difficult to control. 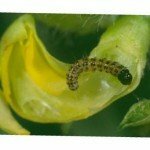 Larvae can be sampled with a beat sheet but be aware that only 20% of larvae inside flowers may be dislodged. Multiply the number of larvae found on the beat sheet by five to estimate actual larval numbers, and adjust for row spacing to calculate larvae per square metre. The recommendation for more accurate sampling is to examine random flowering racemes and tease them open to find any larvae inside. Multiply the number of racemes per plant by the plants per square metre by the average number of larvae found per raceme to determin the number of larvae persquare metre. Take action if you find more than 5 larvae/m2. 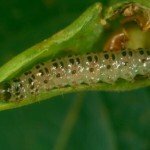 Larvae can be easily controlled with Altacor ® at 70 g/ha, provided spray water volumes are at least the minimum listed on the label (30 and 100L/ha for aerial and ground rig applications respectively) and that nozzles producing medium droplets are used. Do not use nozzles producing coarse droplets, such as air-induction nozzles. Altacor can give as long as three weeks’ protection and kills larvae inside the flowers but growth dilution (the setting of new buds and flowers) may reduce the efficacy of early-budding applications over time. Larvae may take three or more days to die, but stop feeding during this period. Note that synthetic pyrethroids (not registered for this purpose) will not control bean podborer. Please report any significant outbreaks to Hugh Brier or Liz Williams at DAF Kingaroy.